Even though it defies science and understanding at all levels, the results you get in life are seen in your mind’s eye, first. Imagination is the influential force that automatically enables you to visualize and create ANY result you wish. From the simple to the sublime. This astounding breakthrough is yours to start using now. How much do you really use the power of your mind? You're probably no stranger to Earl Nightingale's famous quote, "You become what you think about." And I'm guessing you endorse its underlying belief that the mind has tremendous power to impact outcomes. But are you actively, consistently employing that power to create the results you want? MONEY: Do you have as much as you need and then some? Or are your debts and expenses an occasional, or even constant, source of struggle and worry? CAREER: Do you enjoy what you do for a living? Does it bring you the income level you need and the sense of fulfillment you crave? HAPPINESS: Simple question – do you love YOU? When you look in the mirror, are you truly happy with yourself? I don't mean just with how you look, but with the person staring back at you, the life you're living, the state of your relationships? Years ago, I found myself facing down that same set of questions, and coming up with a whole lot of nos. No, I didn't have enough money. No, my business wasn't where I wanted it to be. No, I couldn't honestly say I was 100% crazy about myself. And no, I had no real idea of how to fix any of it. Or that it even could be fixed. "One of the world's good and great, Matt Furey expertly blends the ancient with the new, combining the power of the modern day warrior, the wisdom of the yogi and the compassionate heart of the living master. If you ever have the chance to learn from Matt, I most heartily recommend you jump at it." At the time, I was fresh off a hugely successful high school and college athletic career, struggling to get a personal training business off the ground and unsure of what my future would look like. One of my clients offered to mentor me in business. As part of that process, he handed me a book with a strange title, by a guy I'd never heard of. That book changed everything for me. Now, I want to change everything for you. Have you ever noticed how, even more than the actors, it's the director of a movie who comes in for the most praise — or the most criticism? There's a good reason for that. No one has more influence over a film than the person sitting in the director's chair. It's the director who tells the actors what to do and how to do it. It's the director who puts all the pieces together. It's the director who transforms something that began in a person's imagination into something alive. Something real. More than 50 years ago, a plastic surgeon named Maxwell Maltz made a fascinating and troubling observation. He observed that many patients continued to see themselves as ugly, disfigured, unworthy, or unlovable… even though reconstructive surgery had corrected their external physical scars or flaws, and in many cases made them beautiful! These patients' self-images didn't change, even though their physical images had. Maltz realized that the human mind was like a theatre, with movies playing in it all day long. Collections of pictures that are connected to ideas, beliefs, and memories, all of which come together to tell a certain story. These "mental movies" were what Maltz's patients were seeing when they looked in the mirror or thought about themselves. And they were far more powerful and real than anything the outside world presented to them. "Dr. Maltz was brilliant and so ahead of his time. At the same time we NEED a modern day master to help guys like me to grow and Matt Furey has really brought Maltz's teachings to life for me and taught them in a way that has been easier for me to use. My results: A new self-image, one that took me from hopelessness and despair when being fired from my former job, to becoming an entrepreneur, best-selling writer and financial success. Matt and Maltz are the perfect combination. The master how got things started and the master who has taken up the mantle and carried on the torch." But Maltz also discovered that, as powerful as these mental movies were, it was possible for a person to access this Theatre of the Mind, as he called it, and replace the images running on its screen with new, positive, affirming images. In other words, a person could become the director of their own mental movies — and project any NEW vision they could imagine onto the canvas of their REAL life. So, after a career spent treating people's outer scars, Maltz began to address their "inner scars" — the negative subconscious beliefs that were holding them back from happiness and success. He developed a system of techniques to help people transform their self-images, and consequently their entire lives. "Maxwell Maltz and Matt Furey are a Dynamic Duo! If you're a winner it will even make you more successful! Thanks Matt." At the time, this was groundbreaking information. No one had ever explored self-image or its implications as Maltz had. Not surprisingly, the idea of controlling and shaping your future, instead of being controlled by your past, had a massive and universal appeal. Psycho-Cybernetics by Maxwell Maltz was the book my friend handed to me all those years ago. I devoured every word of it, and started putting all of Dr. Maltz's techniques to work. But to me, the Theatre of the Mind was the most powerful and exciting technique of all. With it, I finally had a way to understand and smash through any obstacle. I finally had a way to get anything I wanted. Which freed me up to imagine all kinds of amazing things I'd never even THOUGHT of wanting before — and then GET them! I found this one idea so incredibly effective that I started delving even deeper into its possibilities. I invented new ways to access my mind's theatre, and faster, more effective ways of creating the pictures I wanted to see in my life. "Just by receiving your insights and implementing some of your ideas I have more than quadrupled my sales numbers over the past month alone." … not to mention a beautiful wife, two amazing kids, homes on two continents, and a sense of peace and fulfillment that is TOTAL. Early on, people started noticing my unusual and rapid success. And of course, they wanted to know my "secret." Your mental movies dictate your reality. It could be some past trauma you don't even remember. A casual insult, an insensitive remark that your conscious mind forgot but your subconscious stored and has been nurturing for years. It could be old "failures" your mind has hung on to and allowed to eclipse your successes. Or inherited beliefs that don't really serve you and that you don't actually agree with, but are still operating beneath the surface. "Matt, even with 30 years of training in traditional eastern meditation and yoga I was missing a critical piece of the puzzle. My entire life I have practiced exercises for clarity, focus, and relaxation but it never took me anywhere. I deliberated daily on the life I wanted to create but I never got any closer to living that life until I started doing what you teach. Now I realize that I was living life with my finger on the Pause button. You made it so easy, all I had to do is let go and get moving…Thank you,"
What it is doesn't really matter. The bottom line is, if you're not getting what you consciously believe you want — in any area of your life — then someone or something else, NOT YOU, is directing your mental movies and defining your life. If you want that to change, YOU need to take over the job — and learn to navigate all of the twists, turns and challenges involved in becoming a true master of it. And I'd like to show you how. Over 27 years, I've created a system of very specific and extremely powerful techniques that take Maltz's Theatre of the Mind concept to a whole new level of effectiveness. As I've said, they've worked AMAZINGLY well for me. And as you can read elsewhere in this letter, they've worked just as well for those I've taught them to. 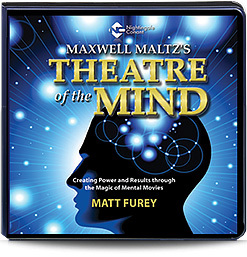 Now I want to share them with you, through my Nightingale-Conant program Maxwell Maltz's Theatre of the Mind: Creating Power and Results Through the Magic of Mental Movies. The REAL key that will unlock Theatre of the Mind. (Hint: it's not IN your mind.) This may surprise you. You may even think I'm a little crazy. But try it once and you'll understand. A simple daily ritual that will align your whole self with your goal. This is a powerful way to shift quickly into a creative state. Fun too! Angry? Awesome! Don't fear anger, and don't try to repress it; it's an incredibly helpful emotion — when you channel it correctly. Deal with it THIS way and it will become one of your most valuable tools. The ultimate mental movie (WARNING: potentially offensive). Some people get upset when I share this technique with them. I beg you to hear me out on it before you do. It's a little controversial. But it's just way too powerful for you to miss! The before-bed technique that will blow you away. It's so powerful and so effective… and it's SO SIMPLE! Makes even the toughest changes so much easier. Walk THIS way. No surprise: a good walk is great for clearing the screen of your mind’s theatre. Big surprise: there’s a right and WRONG way to do it! You’ve probably never taken a walk like this before. And you’ve definitely never experienced these kinds of results! What Vincent Van Gogh and Salvador Dali can teach YOU. It's not an art lesson… but there IS a lesson to be learned from these two creative forces. "Matt, first of all THANK YOU for making this information available… We beat our best month in gross revenue by 30% last month. We were averaging $20K per month and we jumped to $30K. I am very thankful for that. There are many school owners who would kill to be at $30K!" A shocking proposition. If it's true, it will change everything for you. And I can promise you that it IS. The amazing ONE-MINUTE miracle. No matter how busy you are, you can do this. And you won’t believe what it will do for you. What you MUST remember when you make your movies (and what you can safely forget.) Some images in your past belong up on your mental screen. Others can stay on the cutting room floor. I'll tell how to sort one from the other – and experience much better outcomes as a result. The paradox of relaxation. When should you do it? Not when you think. People are often skeptical when they hear this… until they try it themselves. And WAY, WAY more. These are just a few of the TONS of techniques and strategies I give you in this program. But here's the great thing: You don't need to use all of these techniques to access the Theatre of the Mind and start impacting your results. Implement just one, and you'll immediately feel the difference in your thinking and outlook, and see that difference reflected in your life. "Psycho-Cybernetics changed my destiny. From a small farmhouse nearly 2 miles from a major road in Chuckatuck, VA to a successful career as an author, consultant, lecturer to organizations like NASA, Disney, AT&T. Dr. Malltz's suggestions gave me the confidence to bring out my talents and go for my dreams." What will happen is, you'll WANT to start using more and more of them. That's exactly what happened to me, which is why I developed so many. Yep, I got greedy for the good things my system was attracting into my life. You should too! There's an endless supply of it. You're only limited by your ability to imagine. And the best part is, once you get into the groove of directing your mental movies, it becomes virtually automatic. Remember, it's your mental movies that make your reality. Your life as it is today is a direct result of the movies playing in your mind now — and you're not even thinking about it or "trying" to make it happen. It works the same way once you get really good at replacing those movies with the ones you really want. Your mind will do most of the work for you! You'll be able to set the scene in your mind, then sit back and relax as it all unfolds in your life, just as you imagined it. If this all sounds good to you, then click on the link below and let me send you this program to try for yourself, risk free. Are you curious about the unusual name of Maxwell Maltz's book. I know I was when I first discovered it. Turns out, "cybernetics" comes from a Greek term for a helmsman who steers his ship to port. Maxwell Maltz called his system Psycho-Cybernetics to mean (in his words): "Steering your mind to a productive, useful goal… so you can reach the greatest port in the world… peace of mind." If that's a port YOU'D like to arrive at, you’ll find the map to take you there written in the theatre of your mind. And I can tell you from personal experience that it’s the most exciting, most fulfilling voyage you will ever make! Find out for yourself. Click below to order Maxwell Maltz’s Theatre of the Mind RISK-FREE today, and chart your own path to the life of your dreams. P.S. In addition to the 7 main CDs in the program, I'm loading you up with bunch of terrific extras I guarantee you will LOVE. Scroll down to find out more about this awesome freebie, then click the link to get it, along with your RISK-FREE program order. If I do not find this program to be life changing, I can return it any time within 30 days for a full refund. No questions asked.